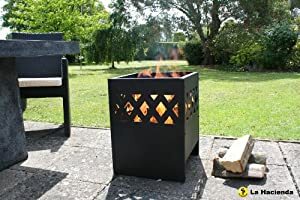 We are presently selling the excellent La Hacienda Ottawa Modern Fire Basket Incinerator Wood Burner at a slashed price. Don't lose out - buy the La Hacienda Ottawa Modern Fire Basket Incinerator Wood Burner online today! 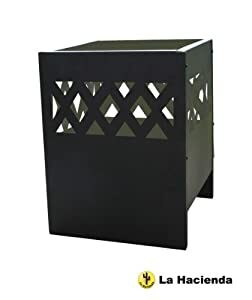 Constructed from durable steel with a black high temperature finish, the La Hacienda Ottawa Steel Fire Basket is a great focal point for any garden. The fire basket has a square shape with steel walls to safely contain burning firewood. Raised legs help to protect the surface it’s placed on from getting singed, enabling you to display it on a lawn, patio or decking. The fire basket is surrounded by a contemporary lattice shaped pattern with holes for the heat to escape and deliver all-round warmth, making it ideal for sitting around with guests or cosying up with a loved one on a chilly evening. The fire basket is delivered flat-packed with instructions and fixings for simple self-assembly. Measures 53cm x 40cm x 40cm.